I’m not quite sure when the time of old school Miniature passed. Derek Zoolander’s phone marked the absolute end of old school miniaturization as cool. The moment he takes out the teeny tiny phone and flips the tiny weeny lid we know the old world of miniaturised anything is so last year – certainly in the electronics department. It was different once. Miniature electronic devices were once the height of slick modern technological chic. Advances in technologies powered by space programmes and the cold war rendered cameras, screens, phones, mics, recorders and files and documents invisible (who could forget Microfiche). When tethered to Bond-like fantasies of kit from Q undertaken by Men From Uncle and underwritten by the futurist accessories of Joe 90’s briefcase, miniature everything was overwhelmingly stitched into the military industrial complex and the spy networks of the 50s 60s and 70s – and subsequently into the wish list of every dreaming boy. Now, nano technologies of ever greater invisibility have kicked visibly Miniature technological anything into touch. That we can now view the world through both sub-atomic God Particular and super-expansive Hubble Spectacular lenses has taken our concepts of inner and outer space to whole new dimensions. And the espionage aspect of miniaturization seems a little old hat. Suddenly, in that particular bright and cruel light, products like Derek’s super mini cell phone seem almost ‘quaint’ – folksy. He may as well have whittled it on the porch. MINIATURE IS DEAD. LONG LIVE MINIATURE. So is miniature dead? Is micro done? Are we all so super nano chip technology friendly that the old school miniature anything doesn’t cut it any more? The drudgery of a late easyjet flight home was illuminated in brilliant splendour by my daughter’s beaming face. The thing that almost made her pop was this: a massive tic-tac box full to the brim with diddly little tic tac boxes – baby tic tacs as she called them. That a receptacle for mints of any size can elicit from her the same ahhhhh usually reserved for when we are google searching ‘the cutest spider in the world’ (a particular favourite); And Bob the Minion (the one with the teddy bear) is remarkable. The big tic tac box filled with mini tic tac boxes is to be fair a stroke of anthropomorphic genius. It’s as if, in a moment of fading brand share and slipping distribution the grand Tic Tac fromage has shouted down the corridors – get me Disney on the line. 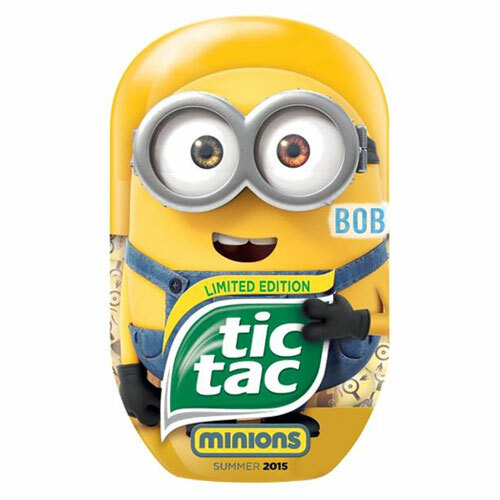 And in a flash they have come up with the idea of a painfully, immutably cute merchandisable tic tac mini series. Smiley face. Smiley face. I heart you. (I can already see the diffusion and content brand play – a new set of collectibles with cultural cache in an animated short – Tic Tac High School featuring a punked cover of the Ramones Rock N Roll High School – shifted to a more euro punk pop ‘tic-i-tac…tic-i- tac High school’ – a place filled with tic tac tweenagers – the loner rock-n-roll tic tac mini; a goofy one; a punky girl one, a geek science girl one and one from a [please choose from one of 6 positive discrimination ethic sub groups]. The ability to anthropomorphize is not the sole domain of the Disney Corporation. We all do it. That’s why they do it. Because we like it. We’re suckers for it. Mini dinky versions of things we know and love are astonishingly attractive. We still love love love mini versions of stuff. Why? Or do we simply find the ‘scale of life’ we lead or feel pressured to lead over-whelming – and yearn for a simpler more childlike time – a time these things remind us of? Do we have some deep-seated yearning for a more manageable dolls-house version of the life we have? One where all of the outrageous consumption is suddenly reset – shrunk – made more manageable and therefore meaningful by reducing all that heavy burdensome stuff that we cant bear to admit is suffocating us? Suddenly, the idea that we might have the opportunity of creating a new Honey I Shrunk the Household Bills/Work Stress/Performance Anxiety/Social Dislocation/Environmental Degradation life seems very attractive at 3a.m when we’re wrestling brain worms and goes bump in the night anxieties about making ends meet. There is certainly anecdotal evidence enough to say that miniaturized versions of everyday things seem to appeal to a quiet and vaguely inexplicable corner of our psyche. We seem to often apply a Minion-like personality to anything we see as having been miniaturized. They are immediately made playful, mischievous, naive, clumsy, goofy flawed and wonderful. And we can do it with anything. Watch people’s faces when a Kellogg’s variety pack is popped onto the table. We love them! These small, diddy, boxed versions of our full-sized favourites and the small piles of cereal that pop out of their waxed paper interior, the perfectly weighed statistical baseline RDA to which all those calorific and vitamin figures apply. The compelling seductive nature of mini dinky things is at work everywhere, not just in the larder or snack cupboard. I challenge anyone to pretend they did not LOVE mini Fish & Chips finger food the first time they came across them at some party of Do. And the Mini Sunday Roast. BOOM. Mini genius. We’ve even got a soft spot for alcoholic miniatures. A perfect dolls-house measure for more meaningful consumption. An alcoholic Tinkerbell-treat best served in a very, very small petal shaped glass. Some might say that the International or Traveller’s miniature fixed the idea of little things into the psyche of the curious and the eternally childlike human being. Since the dawn of the explorer and intrepid traveller, things have been made travel-friendly by re-modelling, re-engineering and reducing items to make them more portable. Miniature versions of your everyday stuff – all specifically ‘shrunk’ to fit the traveler’s demands. Scattered in and around hold-all of the worldly traveller we now find miniature pack sizes of shampoo, body crème, toothpaste, toothbrushes – and an array of miniature things pilfered from distant hotels or the rarified cabin class in-flight offerings – small silver utensils – mini salt and pepper pots – all of it evidence of people who ‘travel lightly through the world’ – hopping from plane to hotel room to slope to beach to boat. Long before the existence of miniature or compressed proucts driven by smarter more sustainable strategies for a reduction in primary and secondary packaging; and the subsequent innovations in dispersal technologies they spawned, there was already a world of dinky mini travel sized everything out there – and to the increasing number of children and child like adults who find themselves on planes trains and automobiles to far flung places, they present a wonderland of child-like, child sized things. The clamouring affection many seem to hold for these miniature things is powerful indeed but perhaps it obscures an even deeper and more powerful and more particular culture at work: one which we might turn to good effect. I believe that these are in fact a much-overlooked form of cultural tapas – a small dainty platter of elegant 21st century consumables. In the same way that tapas takes what is a fairly robust and sometimes coarse set of food ingredients and diminishes them into small fine and elegant mouthfuls, perhaps all of these miniatures are our way of taking the coarse vulgar edges off the galloping excess of our consumption? This for me creates an opportunity to have a bigger conversation in a fun and very non hectoring way. If the first thing their very size and miniature-ness triggers in people is this Minion Effect, then perhaps we could celebrate a more life size, planet sized mode of consumption by elevating the Minion Effect to a national day of consumption consciousness. Perhaps we should have a Miniature day. A day where we celebrate the larger than life lives we lead but in miniature. A day where we take a Minion approach to life – a day filled with dinky things – small brilliant – perfect. Equally – we should compel some enlightened food retailers to miniaturise their servings and prices for one day – e.g. Subway to serve a Baby Foot Long Sub – measured to the length of an infants foot. Finished off with a fractual mini House Of Cards short watched on a mini wind up device. Everything shrunk to a play-size. Pop a quick Cadburys Hero and make a shrink wrapped 50 character tweet. Playfamily sized Family buckets from KFC – sponsored by playmobil.or Fisher Price. Downton Abbey Special played out by Sylvanian Families. A one page miniature copy of VOGUE. So hands up who wants to take a run at applying the Minion Effect – and thinks charming people into reducing what they consume instead of boring them into submission through a love in with miniature stuff might be worth a go? !